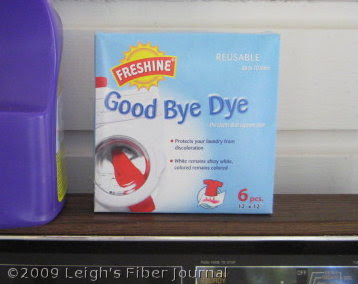 Leigh's Fiber Journal: It Worked! These are the red warp M's & O's dishtowels I wove awhile back. A way while back. I gave one away, and put the other four in my trunk of handwovens. It wasn't until after I had problems with another red warp for a waffle weave sampler, that I became concerned about these. The red in that warp bled, (that post here). When I looked at my M's & O's dishtowels later I thought, "Oh gosh, I'll bet these will bleed too." Actually, I got some good ideas in the comments to that waffle weave post, about various dye grabbing products, though I admit that I didn't try any of them. That is, not until I asked my new DIL about the colors for her kitchen and she mentioned red. I immediately thought of those M's & O's dishtowels and her upcoming birthday. Before I would give them away as a gift, however, I knew I needed to do something about any potential bleeding. Paula Burch has some really good information on bleeding dyes - here. Evidently the culprit is the direct dyes used by commercial dyers. Unfortunately I have a lot of commercially dyed weaving yarns, so this is something I'll have to keep in mind in the future. At least I have found help for it. Phew! Good save! (Beautiful towels BTW). Red can be particularly destructive so I'm glad you found a solution! Good information - thanks. I really like the towels I did in the Ms and Os as they are more absorbent. I wound a warp to do it again and it's still sitting in a basket - sigh. I didn't even know there was such a product! Thank you and the towels are lovely! I told hubby the other day that he shouldn't have bought me the loom because I haven't done a thing with it! I think its because I'm so afraid to wrap it! But he said don't worry winter is coming and I will help you!! Red sure is a bugger. I don't think yarn company's will guarantee that it won't run. I'm sure your daughter in law will love the towels. All reds tend to bleed, but some are worse than others. 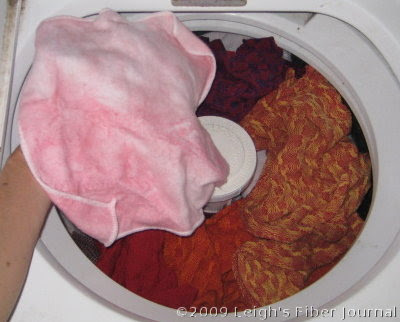 In my experience, the red washfast acid dyes are the absolutely worst for bleeding. Halcyon Yarn has warnings to wash their red yarns before you weave with them. The towels are lovely, I like those warm colors. Colors which bleed sound like a nightmare to me. This looks like a great product, I don't think we can buy it here. The tea towels are wonderful and in colours that are just lovely in the current black or stainless steel kitchens. Actually, ya'll, this product comes under a number of names by a number of companies. I believe that RIT has something, if you have that locally. I'm sure there are any number of others! And about those reds. I was surprised when I read Paula Burch's article because she stated that red is no more a bleed culprit than any other color. It sure seems as though red is the worst, doesn't it, though I've had problems with navy too. Oooh! They look fab! I will keep an eye out for them, must check if they are available in Australia.